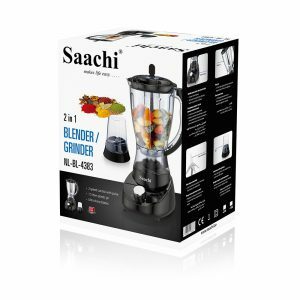 Whether you’re looking to make a nice smoothie to start your day, or a fresh salad for lunch, the Saachi Blender NL-BL-4361 is the one for you. 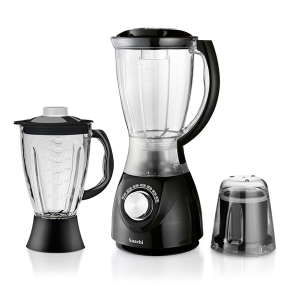 This product acts as a regular blender with a plastic jar, but also comes equipped with 2 other attachments for a glass jar and mill allowing you to carry out many different tasks with this one simple appliance. The pulse function gives you complete control as to how long you wish to run the blender on high-speed and also assists in the auto-clean function when used with a little warm water. We emphasize that the auto-clean feature is only useful for a quick clean-up but a regular cleaning will still be required on occasion for a more effective job. 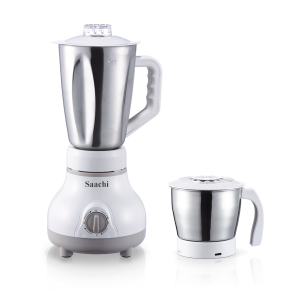 Whether you’re looking to make a nice smoothie to start your day, or a fresh salad for lunch, the Saachi Blender NL-BL-4377 is the one for you. This product acts as a regular blender but also comes equipped with an additional attachment for mill allowing you to carry out many different tasks with this one simple appliance. 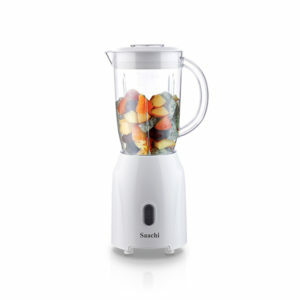 The blender has an unbreakable plastic jar ensuring the durability of this product. The pulse function gives you complete control as to how long you wish to run the blender on high-speed and also assists in the auto-clean function when used with a little warm water. We emphasize that the auto-clean feature is only useful for a quick clean-up but a regular cleaning will still be required on occasion for a more effective job. 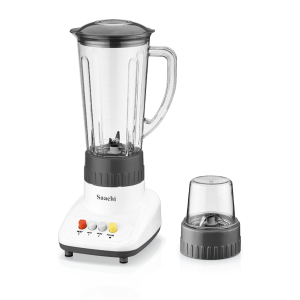 Whether you’re looking to make a nice smoothie to start your day, or a fresh salad for lunch, the Saachi Blender NL-BL-4379 is the one for you. 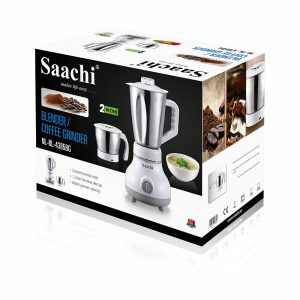 This product acts as a regular blender but also comes equipped with 2 other attachments for mincer and mill allowing you to carry out many different tasks with this one simple appliance. The blender has an unbreakable plastic jar ensuring the durability of this product. The pulse function gives you complete control as to how long you wish to run the blender on high-speed and also assists in the auto-clean function when used with a little warm water. We emphasize that the auto-clean feature is only useful for a quick clean-up but a regular cleaning will still be required on occasion for a more effective job. 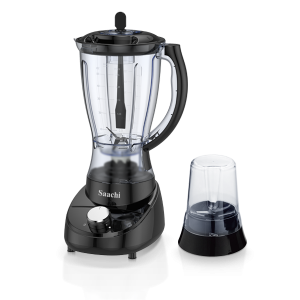 Whether you’re looking to make a nice smoothie to start your day, or a fresh salad for lunch, the Saachi Blender NL-BL-4380 is the one for you. 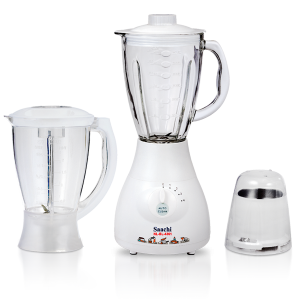 This product acts as a regular blender but also comes equipped with another attachment for a mill allowing you to carry out many different tasks with this one simple appliance. The pulse function gives you complete control as to how long you wish to run the blender on high-speed and also assists in the auto-clean function when used with a little warm water. We emphasize that the auto-clean feature is only useful for a quick clean-up but a regular cleaning will still be required on occasion for a more effective job.